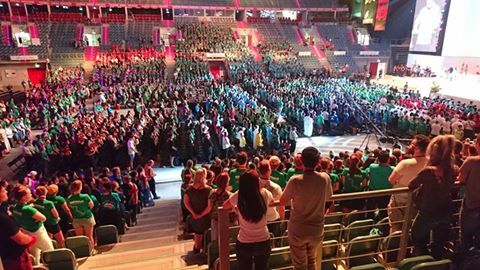 Catholic Earthcare Australia’s Youth Engagement Officer had the privilege of attending this year’s World Youth Day in Krakow Poland. Read below about her amazing journey, experience and friends made along the way! I had the great privilege of attending and participating in World Youth Day in Krakow Poland on behalf of Catholic Earthcare Australia. This week began for some of us with a conference entitled: Integral Ecology – Laudato Si’ – Young heroes of change. This allowed us to hear from a number of Vatican officials including distinguished academics and Cardinals, such as Cardinal Turkson speak about Laudato Si’. Armed with a headset for listening to the translators (most of the event was spoken in either Polish or Italian), we heard from the organisers and then some young people from the global south who spoke of the social and environmental challenges that they are facing through the context of Laudato Si’. The day continued on with more fantastic speakers and some time to network with others. Catholic Earthcare Australia is a founding member of the GCCM and together with other young adults from different countries around the world we formed the GCCM’s first ever WYD team, who led an Eco Festival. Our second day marked the official opening, where Fr Stanislaw from REFA (the Saint Francis of Assisi Environmental Movement in Poland) opened the event with a prayer and then the Global Catholic Climate Movement (GCCM) team cut the ribbon in front of a great turnout of journalists and pilgrims from around the world. We then spent a good portion of the hot afternoon posing for photos with the “#LIVELAUDATOSI” sign that we’d created and showing off our new green t-shirts. In the afternoon we all headed over to Blonia Park for the opening mass. Here we saw pilgrims from all over the world celebrating their faith and a zest for life simply being with other young people from every corner of the globe. Mass was a very interesting experience to follow because it was mostly in Polish and we couldn’t work out how to get the English translation. The music was lovely and because mass is a universal language, every person in the park shared a true communion. We met with World Youth Day pilgrims, collected hundreds of signatures for the GCCM petition and gave out wristbands encouraging people to #LiveLaudatoSi and share on social media. The heavens opened as we headed back to get some food and turn in for the night. It was chaos exiting the venue, but beautiful energy emerged as people waved flags, chanted and sang songs. The third day was one of the biggest days. With the afternoon devoted to a Laudato Si’ Animators Training Program and then a Laudato Si’ concert in the evening, organised by GCCM. As we’d been doing most of our preparation for WYD over Skype, we all had slightly different ideas and experiences from working with groups, so it took a little time to sort out the logistics. I took on the role of MC for the afternoon. With a great host of presenters and organisers, the workshop was a hit. We had a group from a CIDSE member (the international alliance of Catholic development agencies) in Slovakia, a large group from the US, a group of Magis from Africa and a group from Australia (Wollongong diocese). I was in charge of keeping the group energised and engaged between sessions, keeping them moving and happy. This involved showing videos, singing and participating in energising activities that are part of the Laudato Si’ Workshops for school groups back in Australia. We got them thinking about a holistic approach to Laudato Si’, and about planning the ways in which they would change their lives to respond to the call. We had some fantastic plans come out of the day including a young man from the US who said that he wanted to make the whole fleet of buses where he works to be powered by electricity rather than petrol. Karina from 350.org led a short session on divestment, and it turned out that the US group were actually from her home town, and that she knew a few from church and high school. After the Laudato Si’ Animator session, we all headed back to the park for the Laudato Si’ concert. It was a great night, with performers from all over the world including a fashion show, singing, drumming and prayer. I felt humbled to be chosen to read out the Laudato Si’ prayer for creation in English along with those who read it in languages such as Swahili, Portuguese, French, Polish and Tagalog. The night was capped off by a truly incredible performance which told our creation story. It was led by a Polish amateur acrobatics troupe who used acrobatic equipment, fire and all manner of props to create an amazing visual performance. My words cannot do it justice at all, but it was a fitting end to an awesome day of fun and formation. On the fourth day we ran more workshops focused on sharing our eco-testimony with others. We each ran a workshop twice, once with a group of young people from Ireland and another for a group of pilgrims from all around the world, including Togo, Australia, Poland, France and Slovenia. Facilitated by Daniel and supported by myself, Angela and Karina, we helped young people who had never really thought about the call to care for our common home, come up with a way to share their love for creation. This came from personal experiences of smog (air pollution), deforestation, experiences with extreme weather events and the call for climate justice. We then headed back to Blonia Park to see the Pope arrive in a tram instead of coming past in the Pope mobile. He came past in a tram with people with disabilities called the Tram Del Papa. We spent our afternoon in a team meeting before having a networking dinner with members of Caritas Internationalis. Day five was the final day of the Eco-Festival. We rounded out our time in the space with a blessing of the climate prayer tree. 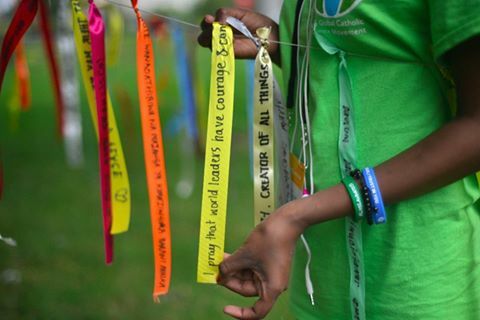 All week, people had been writing prayers on ribbons that they added to the strings we tied to a tree. Malcolm Hart, Director of the Australian Office for Youth, also managed to visit and see the space, adding his own prayer and talking to the GCCM team and me. He also very kindly gave us four tickets to the special section for the final mass. This was a section with chairs, where we were the closest we could get to the Pope without being ordained! We all then headed over to Blonia Park for the last time for the very moving experience of the ‘Stations of the cross’. We had English translation and could understand what the Pope and the readers were saying. The Pope shone a particular light on the plight of refugees. A story which particularly hit home for my friend Leila, who is herself a refugee from Burundi now living in Kenya. Pope Francis encouraged us to have compassion in responding to the plight of refugees everywhere. On Day six we packed up the Eco-Festival and undertook the huge journey to Campus Misericordiae where the vigil, final mass and sleep-out were held. It was an amazing experience. We were particularly lucky that it didn’t rain overnight, although it did rain the afternoon before, and the afternoon after the final mass. We were over joyed being able to show the GCCM Laudato Si’ video to millions of people. As we were in the special section during and after the Vigil so we managed to spend some time holding up our banner for photos, a banner that literally thanks Pope Francis for Laudato Si’. I spoke with someone who was wearing a “Divest from Fossil Fuels” hat and when I complimented him on it, he insisted on giving it to me. I gave him a #LiveLaudatoSi wristband in return. The memories that will stay with me are of listening in awe to Pope Francis talking about young people being called to become activists, to stand up and fight for what we believe in and the strengthening of faith that I experienced in the birthplace of Saint Pope John Paul II. Bring on World Youth Day in Panama in 2019!